MarkCopoulos Jan 26, 2015 Legal Updates Comments Off on The Right to Remain Silent: Use it. The most important rule of criminal defense is this: do not talk to the police. The police have no obligation to tell you the truth. Their job is to arrest criminals. Arrests require probable cause, which takes evidence. Any information you give them may be a building block in the case they are making against you. If you have committed a crime, or are a suspect in a crime, speaking to the police will not help your case. If you give a statement, this statement can be used as probable cause to arrest. If you have not been arrested, it is probably because there is insufficient evidence. Your statement is the evidence that could put you behind bars or result in a bulletproof case against you. Nothing is worse than a self-incriminatory statement made by a defendant. Cases with such statements made are rarely won. Sometimes it makes sense to talk to the police. Cooperation can help your case. Nevertheless, any conversation should happen in the presence of a skilled attorney. If you must talk, exercise your Sixth Amendment right to an attorney and your Fifth Amendment right against self-incrimination. 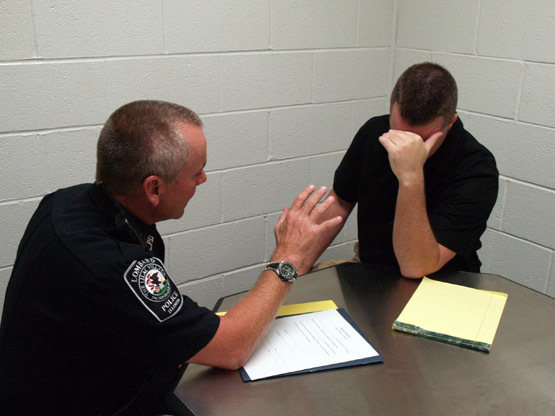 Another reason to exercise your right to a lawyer is because a police interrogation is personal. When you are questioned by police your emotions are involved. You are speaking with skilled interrogators. You don’t want to go into this environment alone, especially when you have something to lose. You need a cool head in the room sitting next to you, counseling you every step of the way. Anything you say can and will be used against you. If arrested or even stopped by police, the best thing to say is probably nothing at all. Or if you must speak, ask to speak to your lawyer.